France coach Marc Lièvremont has asked for more of the same after naming an unchanged squad for his side's Six Nations Grand Slam decider against England at the Stade de France on Saturday. Les Bleus tore through Italy for a 46-20 victory in Paris on Sunday and will employ the same personnel for the vital visit of Martin Johnson and England. France have not secured a clean sweep since 2004 and will be mindful of over-confidence after England again failed to produce the goods in a 15-15 draw with Scotland at Murrayfield. 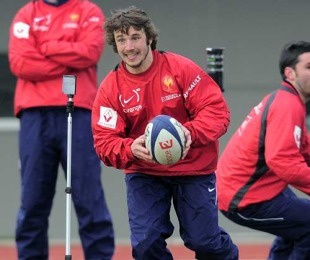 Biarritz scrum-half Dimitri Yachvili remains with the squad after being called-up as an injury replacement for Toulouse's Freddie Michalak while Castres' Marc Andreu, Clermont's Julien Malzieu and Brive's Alexis Palisson are retained as options on the wing despite Vincent Clerc's return to fitness. Defence coach Dave Ellis, who also coaches Guinness Premiership side London Irish, has called on the squad to put right a disappointing recent run against England. "The thing you've got to realise and the message we'll pass onto the players is that we haven't beaten England in a competitive game for four years now," he said. "The last time we beat them in the Six Nations was in 2006. Even though we won the two preparation games for the World Cup, they were just more or less friendly games. "England beat us in the semi-final of the World Cup, they beat us in 2008 at Stade de France and we lost there heavily last year. So there is a bit of history there that we need to put right. I think people have been underestimating the English. They've got into a process where they're trying a new No.9 playing with Wilkinson and various new players in the backline and the forward pack. "They've not been beaten by big scores. I was at Twickenham when Ireland beat them but it could have gone either way and it was the same against Scotland. If things had gone right for them, they could have beaten Scotland and it could have been a different story for this week. England just need something to go right like it did last year when everybody was asking questions about them."